A cliché I know but ‘what a difference 24 hours makes’. 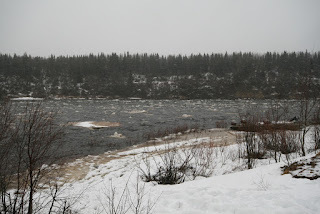 Yesterday morning was pretty miserable, we woke to a strong north wind and the snow of Saturday continued, the river was still rising and there was enough ice coming down to put us off boating. We had a TV crew here to film the opening of the season and the best we could do was to film fly tying in the warmth of the lodge and some casting practice on the ‘lawn’ – not exactly what we had planned but there really was nothing much to do other than sit it out and waiting for an improvement. 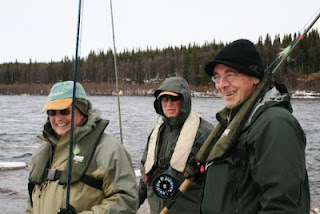 ﻿﻿﻿﻿﻿﻿In the afternoon a few intrepid fishers took to the river, Brian Anderson had a lovely fresh 8lber from Duck here in Lower Camp and in the evening Hugh at Middle reported that they had had a couple of fish off the island. Hugh and head guide, Misha, seemed enthusiastic about the prospects; despite the cold water temperature (0.5⁰C) they had seen fish running through Generator Pool and they had established that Clarkes, Beach, Snake Pit, Fortress, East Generator, Birthday and Party Pools were all well clear of ice on the banks. We had a sharp frost last night and this morning was crisp, clear and bright. The river has steadied off and there was quite a rush to get breakfast out of the way and the fishing started. 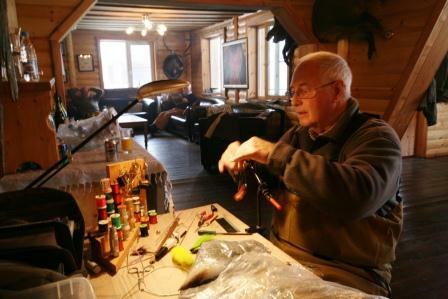 I look forward to bringing you news of the first full day of fishing tomorrow.